Congratulations to Houston Upper Elementary for achieving PBIS Tier 2 Model Site status. Houston Upper Elementary will begin its annual Drug Awareness & Red Ribbon Week on October 22 thru October 26. Monday-- "I Love My Drug Free For Selfie". Wear red. Tuesday-"Be Someone's Hero! Stand Up to Bullying." Wear orange. Wednesday-"The Symbol of Hope, The Color of Strength." Wear pink. Friday- "Say Boo to Drugs". Dress as your favorite book character. Houston Upper Elementary just took their state tests and it seems that the time just flew right by. We all are now finished with our state tests and almost finished with school, but state tests are not what school is all about. Sure state tests play a big role, but school is not just about that. It is also about the learning that leads up to it. We have all done a great deal of learning this year and we are sure we will next year as well. I am sure we are all ready for the summer, and you are in luck because summer is just a few days away. Your teachers will miss you, and you will miss them also. Teachers need a small break from having all of those kids around, and the students think they need a break from learning (though they have a break every weekend). We just wanted to wish everyone good luck next year and have a great summer!! 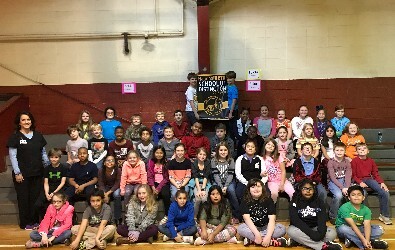 Houston Upper Elementary School will begin its annual Kickball Tournament on February 9, 2018. The championship game will be on February 16, 2018. Donation $1.00. HUES took all the students with perfect attendance for the month of November to the Topper Zone. By recognizing students with perfect attendance, HUES reinforces that strong attendance habits are valued. National Beta announces Houston Upper Elementary as a 2017-2018 National School of Distinction! This award is an honor for Beta Chapters striving towards academic achievement, exemplary character, demonstrated leadership and service to others and who increase their membership by ten or more percent. Pictured are the 4th and 5th graders, shown with their sponsor, Lysbeth Parker. HUES recently inducted 61 students into the Jr. 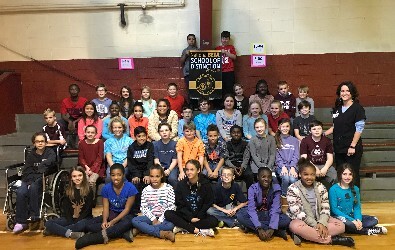 Beta Club for a total of 93 students. The Houston Upper Elementary Jr. Beta Club is sponsoring a hurricane relief drive. Many families have been devastated by the recent storms, and we would like to give a helping hand. The devastation is overwhelming. There are some who lost all of their material possessions, including their homes. We have reached out to people in the Houston, TX area who have been affected to ask for advice on the items that are most needed. If you are able to support our relief drive, please send any of the above items with your child from now until September 29th. If your child is unable to carry your donations, please feel free to deliver them to our school office. Congratulations to Houston Upper Elementary Third Graders for a superb job on the 3rd Grade Reading Summative Assessment. HUES third graders had a passing rate of 98.1 percent this year which is the highest percentage of the last three years. Houston School District had the 4th highest passing percentage in the state! HUES would like to thank the third grade parents for their support. Special thanks to the third grade reading teachers: Mrs. Angela McFarland, Mrs. Lori Moore, Mrs. Morgan Moss, Mr. Nathan Newell, and Mr. Rimmer; and the RtI Coordinator/ Interventionist, Mrs. Rebecca Wortham, for all their hard work and effort in helping these students to be successful. Houston Upper Elementary is proud to be an "Accelerated Reader” School. Pictured below are the elementary students who were recently honored at an Accelerated Reader Award Program. The Accelerated Reader program, known as AR, is a program that allows students to read books on their reading level and then take computerized reading comprehension tests to earn points. Each book is worth a certain number of points based on its length and reading level. Houston Upper Elementary students earned cash prizes for reading, thanks to PACE, Partners in Achieving Community Excellence. Tom Byrne, PACE treasurer, presented cash prizes to third, fourth and fifth graders, ranging from $5 - $50, to the top 10 point earning students in each grade, giving out a total of $455. Lysbeth Parker, librarian, runs the AR program at HUES. She keeps a point board outside the library and puts students’ names on it once they earn 10 or more points on the AR tests, updating it monthly. 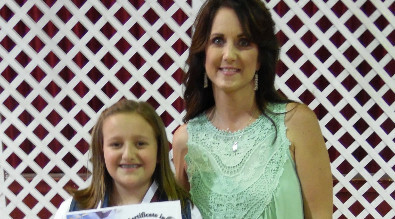 Houston Upper Elementary School Overall First Place Accelerated Reader with 207.2 points was Dixie Ellison pictured below with Mrs. Parker. NEA’s Read Across America Day is a nationwide reading celebration that takes place annually on March 2—Dr. Seuss’s birthday. HUES celebrated Read Across America by having special guests visit each class and read to the students. Mr. Trevor Hampton would like to thank each guest for participating and helping to make this year’s Read Across America Day a success. HUES Jr. Beta Club will participate in National Beta Week during the week of March 6-10, 2017. Students are encouraged to write on a "make your mark poster" to document how they have made a positive mark on the school, in the community, or with friends/family. Students will share and learn what Beta is all about. Students are encouraged to help others out at home, school, and in the community. Students will make a personal growth plan. Students are encouraged to do what it takes to achieve their goal. The National Beta Club colors are gold and black. Students are asked to wear black, gold, or yellow to show “Beta Spirit”. Houston Upper Elementary is proud to announce the establishing of HUES Jr. Beta Club. Membership is open to any fourth or fifth grade student who maintains A’s and B’s on each report card and exemplifies good character. This year invitations for membership were issued to sixty-two students who met eligibility criteria. We would like to recognize and congratulate the following members of HUES Jr. Beta Club. This coming Friday, November 18, 2016 is the annual S.H.O.P. (Students Helping Others Planet wide) Expo at the HUES gym from 10-2. We are raising money to help our local chapter of Dream Riders Biking for Children. The students have already participated in a can drive, and the United Blood Services blood mobile will be at the school on Friday.